The Chicago Black Hawks have now gone 11 straight games without losing as they doubled the New York Rangers 4-2 last night at Madison Square Garden in New York. As is so often the case this season, Bobby Hull was once again the big gun for Chicago. The Golden Jet scored his 30th and 31st goals of the season as the Black Hawks roared back from a 2-0 deficit. 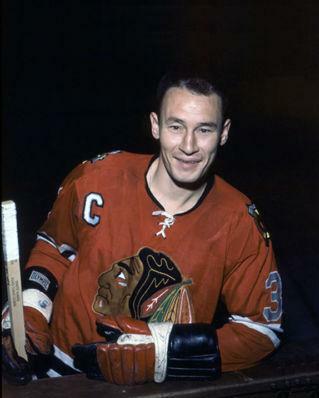 Pierre Pilote, with his first, and Red Hay also counted for the Hawks. Don Marshall and Rod Gilbert were the Ranger marksmen. Pierre Pilote scored his first of the season for Chicago. The Rangers outshot Chicago 19-5 as they dominated the first period. Hawks netminder Glenn Hall was spectacular, despite giving up two goals and kept his club in the game until they got untracked. Overall, he made 36 saves. In the Ranger goal, Jacques Plante blocked 25 shots. The Boston Bruins yesterday angrily denied a rumour that they had secretly played and lost a game to the Russian national hockey team. 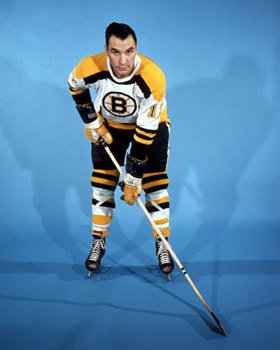 The report said that the touring Russian team had met the Bruins at an undisclosed location and were leading Boston 7-2 when the Bruins demanded that the match be ended. The report did not mention when the game might have been played. Dean Prentice, the leading scorer for the Bruins, has been diagnosed with compression in the lower vertebrae in the lower back. The club says he will be out of the lineup for at least another week. Prentice was injured in Sunday night’s game against Chicago. Dean Prentice has a serious back injury which might keep him out a while. With the Rochester Americans unable to secure practice time in their own rink, the team motored to Toronto where Leaf coach Punch Imlach arranged a scrimmage with the parent club. Imlach wanted to see first hand which, if any farm hands, has the stuff to compete at the NHL level. Imlach was not disappointed with the American League team’s showing. The result of the 30-minute scrimmage was a 1-1 draw, but two of the younger Amerks stood out. Peter Stemkowski, a tall, rangy centre who toiled for the Marlboros last season, looks like he is just about ready for big-league competition. In fact, if Stemkowski played anywhere but centre, he would likely be with Toronto now. Leafs are well-stocked down the middle and would have to move someone to make room for the rookie. Jerry Cheevers – showed great potential in scrimmage against parent club. The real star of the scrimmage was Rochester goaltender Jerry Cheevers. 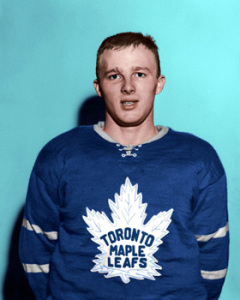 The Leafs seemed to be able to fire at will in Cheevers’ direction but the 24-year-old from St. Catharines was outstanding and gave every indication that he has enormous NHL potential. With veterans Johnny Bower and Terry Sawchuk firmly entrenched in the Toronto crease, Imlach will certainly have a tough decision to make next summer when draft time rolls around. The Toronto Marlboros maintained their grip on first place in the OHA Junior A series with a 3-1 win over the Oshawa General before 4455 fans in Oshawa last night. In the other OHA games, the Montreal Junior Canadiens skated to a 2-2 draw with Niagara Falls, while Kitchener and Peterborough engaged in a wild 6-6 stalemate. Toronto goaltender Jerry Desjardins returned to the Marlie net after a night off and put on a great goaltending display. The only Oshawa player to beat him was Bobby Orr, on a power play. Marlie marksmen were Brit Selby, Mike Corrigan and Neil Clarke. In Niagara Falls, the Flyers jumped out to a 2-0 lead on goals by Jean Pronovost and Bud Debrody before the junior Habs mounted their comeback. Jacques Lemaire and Bob Lemieux drew the Canadiens even. At Peterborough, the Rangers rallied for three goals in the final eight minutes to grab the single point with the Petes. Ken Gratton, Bruce Reier, John Beechey, Billy Hway, Sandy Fitzpatrick and Mike Robitaille fired the Kitchener goals. Danny Grant led the Petes with three markers, with singles coming off the sticks of Andre Lacroix, Garry Monahan and George Godson.